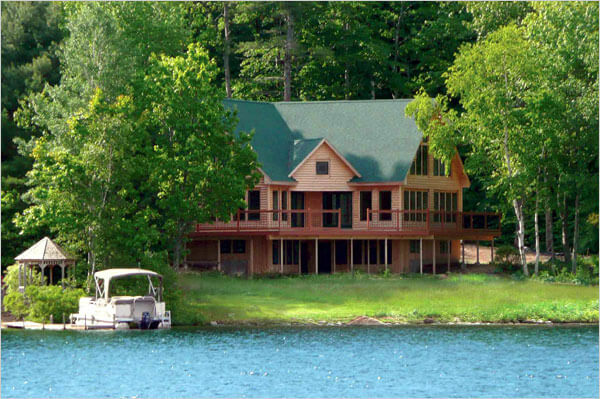 Lake living, we all love it and crave it and want to take advantage of the benefits of living on a lake. Whether you currently live on a lake or are dreaming and planning for it, we have some fun and interesting lake living facts for you. 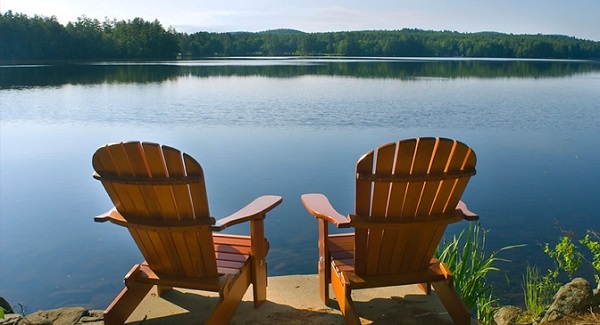 The first thing that comes to mind about lake living is relaxation. Looking out over your back yard and seeing the wonderful view of the lake is something that can make anyone’s stresses melt away. The sound of the water is soothing and soaking in the lake can be refreshing. Your mornings start with a beautiful sunrise and end with a glorious sunset. The relaxing benefits of lake living are endless. Lakefront property owners have the benefit from having more fun relaxing activities at your disposal such as, boating, fishing, skiing, and swimming. Getting out near the water or on it provides you and your family many opportunities to exercise and the benefit to stay fit. And we all know that a healthy body equals a healthy mind. DID YOU KNOW? Lake Superior, the largest freshwater lake in the world is so large that it could cover the entire United States in 4 feet of water. Scott Freerksen with Lakefront Living Realty, based out of Massachusetts, stresses the importance of having the lakeshore area of your home clean and well maintained. Lakefront homes without a nice looking shoreline area can lose as much as 12% of their value. Overgrown lake weeds, algae problems and a build up of lake muck at the bottom of your lake are all factors in diminishing the value of a lakefront property. So a lake home that has an overgrown, weedy shoreline has a value of $400,000. This means it could be worth up to $48,000 more if you were to invest a bit of time and money. For years Scott Freerksen has always encouraged his clients who have aquatic vegetation and muck issues to contact us at Weeders Digest so we can assess their situation and get the right lakeshore management tools and solutions in their hands. DID YOU KNOW? That people who have aeration around their dock create a thriving fish environment and attract up to 10x more fish to their shoreline? 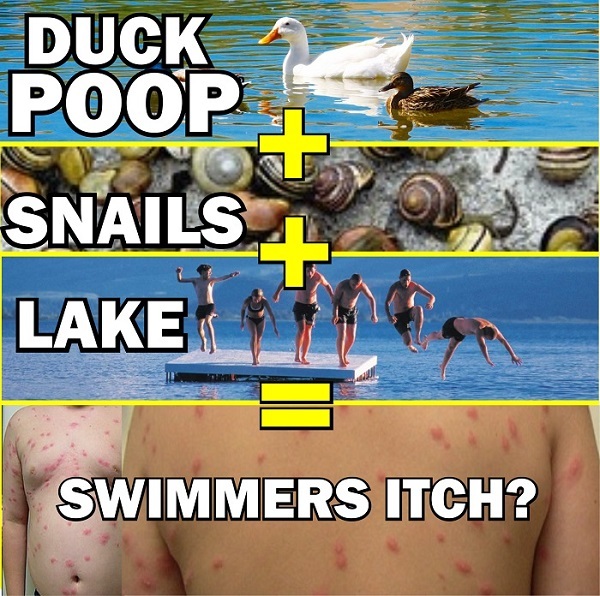 Swimmer's itch, also known as duck itch, lake itch, is a parasite and known scientifically as cercarial dermatitis, appears as a skin rash. The adult parasite lives in the blood of infected animals such as ducks, geese, gulls, swans, and certain mammals. The parasites produce eggs that are passed in the feces of infected birds or mammals. If the eggs land in or are washed into the water, the eggs hatch, releasing small, free-swimming microscopic larvae. These larvae swim in the water in search of a certain species of aquatic snail.If the larvae find one of these snails, they infect the snail, multiply and undergo further development. Infected snails release a different type of microscopic larvae (or cercariae, hence the name cercarial dermatitis) into the water. This larval form then swims about searching for a suitable host such as a bird, muskrat to continue the lifecycle. But sometimes they find a human instead. Although humans are not suitable hosts, the microscopic larvae burrow into the swimmer's skin, and may cause an allergic reaction and rash. Because these larvae cannot develop inside a human, they soon die. As of now one of the best ways to prevent swimmer's itch is to you use a Swimmer's Itch Prevention Product. If you do however get it, most cases of swimmer's itch do not require medical attention. DID YOU KNOW? there are 117 million lakes in the world making up 3.7% of the total surface. If you added up the total distance of the shorelines of all the lakes in the world it would be about 2 million miles long.